We relate the performance of trend following strategy to the difference between a long-term and a short-term variance. We show that this result is rather general, and holds for various definitions of the trend. We use this result to explain the positive convexity property of CTA performance and show that it is a much stronger effect than initially thought. This result also enable us to highlight interesting connections with Risk Parity portfolio. Finally, we propose a new portfolio of options that gives us a pure exposure to the variance of the underlying, shedding some light on the link between trend and volatility, and also helping us understanding the exact role of hedging. lter itself): it is wrong to expect a 6-month trending system rebalanced every week to hedge against a market crash that lasted only a few days. tting only the time-scale of the lter, we get a very good correlation (above 80%), and capture the drift completely. This shows again that CTAs are simply following a long-term trending signal, and there is little added value in their idiosyncrasies. cation. We however have found that CTAs do offer an interesting hedge to Risk-Parity products, which we approximated with a very good precision by long positions on the main asset classes.A ll in all, these results prove that a trending system does offer protection to long-term large moves of the market. We then turned our attention to the link between trend and volatility. We found that a simple trending toy-model shares an exposure to the long-term variance with a naked straddle. The difference is the fact that the entry price for the straddle is fixed by the at-the-money volatility, while the trend pays the realized short-term variance. We then propose a very clean way to get exposure to this short term variance by using the trending toy-model as a hedging strategy for a portfolio of strangles. This is a simple, model-free portfolio that offers the same pay-off than traditional variance swaps." 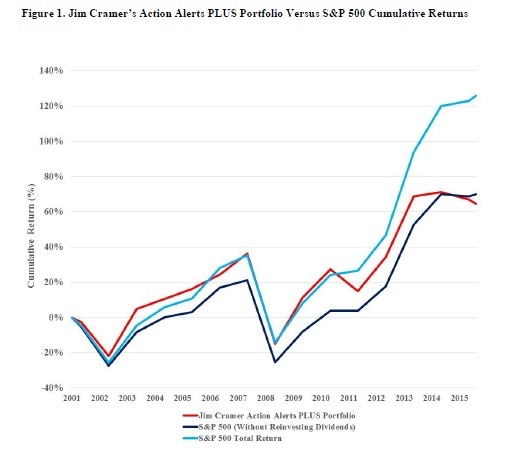 This study analyzes the complete historical performance of Jim Cramer’s Action Alerts PLUS portfolio from 2001 to 2016 which includes many of the stock recommendations made on Cramer’s TV show “Mad Money”. Both since inception of the portfolio and since the start of “Mad Money” in 2005 (when it was converted into a charitable trust), Cramer’s portfolio has underperformed the S&P 500 total return index and a basket of S&P 500 stocks that does not reinvest dividends (both on an overall returns basis and in Sharpe ratio). These findings contrast with previous studies which analyzed Cramer’s outperformance in short windows before the 2008 financial crisis. Using factor analysis, we find that Cramer’s portfolio returns are primarily driven by underlevered exposure to market returns and in some specifications tilting toward small cap stocks, growth stocks and stocks with low quality of earnings. These results have broad implications for market efficiency, the usefulness of single name stock recommendations made on television, financial education, and the implementation of academic factors thematic in Cramer’s portfolio. "The usefulness of the financial advice from CNBC financial markets commentator Jim Cramer and other television finance personalities has historically been one of controversy. Returns data from the Action Alerts Portfolio PLUS are provided by TheStreet.com which are also made available to the public (See Table 1, Figure 1). Subscribers are also given access to portfolio holdings data which we use to confirm some the findings of our risk factor analysis. The results of the regressions are reported in Table 2. Analyzing the entire history of the portfolio, our CAPM specification finds a CAPM Beta of approximately 0.95 (statistically significant at the 1% level) and a negative alpha of -2.38% that is statistically significant (at the 10% level). Being underleveraged (underinvesting in the market portfolio) in part may be a result of the portfolio’s policy of not reinvesting cash dividends. Across almost all of our specifications, the results demonstrate that underleverage explains most of the portfolios relative underperformance given the S&P 500’s positive absolute performance over the period. This is also confirmed by the portfolio holdings data which indicates that the AAP portfolio often holds a significant cash position, largely to make its annual cash distribution in March to make charitable contributions. In our Fama-French (1993) three factor specification, we do find that the portfolio has some exposure to small caps given that the SMB factor is statistically significant at the 10% level, something confirmed by the portfolio holdings data. We do not find such a statistical significance when only looking at the entire history of Mad Money from 2005. Also, when controlling for momentum factors in our Carhart (1997) four factor specification, statistical significance of the size factor also disappears nor do we find evidence of statistically significant exposure to momentum stocks. However, we do find that when analyzing the March 2005 to March 2016 time period, when adding the extra size, value and momentum factors in the Fama-French (1993) and Carhart (1997) 4 Factor regressions that the statistical significance of the negative alpha of -3.06%, found in the CAPM for the same period, disappears. When we include the Frazzini and Pedersen (2014) Betting-Against-Beta factor and the Asness, Frazzini and Pedersen (2013) Quality Minus Junk (QMJ) factor, we find some evidence that Cramer tilts toward growth stocks and away from stocks with high quality of earnings. Using the factor analysis results obtained above, we also construct a “robo-Cramer” portfolio that uses the same factor loadings as estimated from the regressions. The systematic Cramer-style portfolio is constructed from the same regressions of monthly excess returns, namely the Carhart Four Factor regression using data over the entire time period (August 2001 to March 2016). The portfolio is rebalanced annually at year-end to keep constant weights. The explanatory variables are the monthly returns of the standard size, value, and momentum factors. Note that such a synthetic portfolio outperforms Cramer’s actual cumulative returns for the entire period. Konstantinidi et. al. state in their broad survey of Volatility-Index forecasting: "The question whether the dynamics of implied volatility indices can be predicted has received little attention". The overall result of this and the quoted papers is: The VIX is too a very limited extend (R2 is typically 0.01) predictable, but the effect is economically not significant. This paper confirms this finding if (and only if) the forecast horizon is limited to one day. But there is no practical need to do so. One can - and usually does - hold a VIX Future or Option several trading days. It is shown that a simple model has a highly significant predictive power over a longer time horizon. The forecasts improve realistic trading strategies. VIXret(h) is log(VIX(t+h)) – log(VIX(t)) where h is the forecast horizon in trade days. VIX(t) is the current VIX-value. VXV(t) is the 3-months volatility index. IVTS(t) is the implied-volatility-term-structure defined as VIX(t)/VXV(t). The model uses the current VIX level, VXV can be interpreted as a smoothed version of the VIX. The IVTS is a measure of the current term-structure. Campasano & Simon proposed in [J. Campasano, D. Simon: The VIX Futures Basis: Evidence and Trading Strategies. June 27, 2012] a simple VIX Futures strategy to exploit the positive bias. VXF is the VIX Futures Price. TTS are the Trade-days Till Settle (expiry). One enters a short VIX Future position if R(t) is above a given threshold and sells the Futures back if the basis is either below a lower threshold or one is close to the expiry. One can replace the current VIX value with the VIX forecast at expiry. The strategy with the plain VIX has a P&L of 110.2% with a Sharpe-Ratio of 0.93 and a maximum relative drawdown of 18.2%. The forecast improves this to a P&L of 156.2%, a Sharpe-Ratio of 1.12 and a drawdown of 16.8%. "U.S. macreconomic risk factors can successfully describe the return premia on both value and momentum strategies, and combinations of them across both countries and asset classes. In addition, it can explain the negative correlation between these two return premia. We present three main results. First, the positive return premia on value and momentum, across both asset classes and countries, can be explained by the estimated prices of risk and loadings on the global risk factors. For example, the value, momentum, and combination return premia that are aggregated across all asset classes and all countries are 0.29%, 0.34%, and 0.32% per month, respectively, and they are statistically significant. The global macroeconomic factor model produces expected returns that are 87%, 109%, and 103% of the actual return premia, respectively, with small and statistically insignificant pricing errors. We find similar results for separate asset classes and across different countries, thus, offering a unified macroeconomic risk explanation of value and momentum return premia. return correlations with the correlations of the return premia. For example, remaining with aggregated value and momentum across all asset classes and markets, the actual correlation between the value and momentum strategies is -0.48, whereas the implied correlation of the two strategies from their expected returns is -0.47. We also observe differing factor loadings within each asset class and country. These differences in the factor loadings allow us to match the actual negative correlation between value and momentum return premia with a negative correlation between the expected returns of value and momentum strategies across asset classes and countries. The third result shows that the global macroeconomic factor model does a good job in explaining the return premia on the combinations of the value and momentum strategies both in the time series and cross section. This is interesting since Asness, Moskowitz, and Pedersen (2013) note that because of the opposite sign exposure of value and momentum to liquidity risk, the equal-weighted (50/50) combination is neutral to liquidity risk. However, we show that this 50/50 combination is not neutral to global macroeconomic risk even if the value and momentum return premia have opposite sign exposures with respect to the global macroeconomic factors. These exposures have different magnitudes and this is clearly seen when we examine the loadings of the combination strategies." Everyone seems to want to time factors. Often the first question after an initial discussion of factors is “ok, what’s the current outlook?” And the common answer, “the same as usual,” is often unsatisfying. There is powerful incentive to oversell timing ability. Factor investing is often done at fees in between active management and cap-weighted indexing and these fees have been falling over time. Factor timing has the potential of reintroducing a type of skill-based “active management” (as timing is generally thought of this way) back into the equation. I think that siren song should be resisted, even if that verdict is disappointing to some. At least when using the simple “value” of the factors themselves, I find such timing strategies to be very weak historically, and some tests of their long-term power to be exaggerated and/or inapplicable. "Finding a factor with high average returns is not the only way to make money. Another possibility is to “time” the factor. To own more of it when its conditional expected return is higher than normal, and less when lower than normal (even short it if its conditional expected return is negative). An extreme form of factor timing is to declare a previously useful factor now forever gone. For instance, if a factor worked in the past because it exploited inefficiencies and either those making the exploited error wised up or far too many try to exploit the error (factor crowding) one could imagine the good times are over and possibly not coming back. I think of these as the “supply and demand” for investor error!7 Factor efficacy could go away either because supply went away or demand became too great. Why do I call factor timing a “siren song” in my title? Well, factor timing is very tempting and, unfortunately, very difficult to do well. Nary a presentation about factors, practitioner or academic, does not include some version of “can you time these?” or “is now a good time to invest in the factor?” I believe the accurate answer to the first question is “mostly no.” However, my answer is usually met with at least mild disappointment and even disbelief. Tempting indeed. I argue that factor timing is highly analogous to timing the stock market. Stock market timing is difficult and should be done in very small doses, if at all. For instance, Asness, Ilmanen, and Maloney (2015) call market timing a “sin” and recommend, using basic value and trend indicators, to only “sin a little.” The decision of how much average passive stock market exposure to own is far more important than any plausibly reasonable amount of market timing. Given my belief in the main factors described above – that is I do not think they’re the result of data mining or will disappear in the future – the implication is to maintain passive exposures to them with small if any variance through time. Good factors and diversification easily, in my view, trump the potential of factor timing. While I believe that aggressive factor timing is generally a bad idea, there is one possible exception. Perhaps the only thing of interest in these value spreads would be if and when we see things unprecedented in past experience. The 1999-2000 tech bubble episode focused on by AFKL was indeed such a time. If timing were ever to be useful it would be at such extremes. Factors being “arbitraged away” or an extreme version of “factor crowding” would likely entail observing such extremes. In the extreme crowding case we’d see spreads in the opposite direction of what value experienced in 1999-2000 when the value factor looked much cheaper than any time in history. So, an “arbitraging away” would lead to a factor looking much more expensive than any time in history. To date, the evidence that this has already occurred is weak and mixed. For example, if you look at the “value spread” of the factors through time to judge them as cheap or expensive, you get very different answers depending on whether you use, say, book-to-price or sales-to-price. For instance, if you use book-to-price you’d find the value factors currently look cheap versus history (though nowhere near the levels of 1999-2000) and the non-value factors (things like momentum, profitability, low beta) look expensive. However, if instead you use sales-to-price to make this judgment you find current levels are far closer to historical norms. In sum, here’s what I would suggest. Focus most on what factors you believe in over the very long haul based on both evidence (particularly out-of-sample evidence including that in other asset classes) and economic theory. Diversify across these factors and harvest/access them cost-effectively. Realize that these factors, like the stock market itself, are now well-known and will likely “crash” at some point again. So, invest in them if you believe in them for the long-term and be prepared to survive, not miraculously time, these events sticking with your long term plan. If you time the factors, and I don’t rule it out completely, make sure you only “sin a little.” Continue to monitor such things as the value spreads for signs these strategies have been arbitraged away – like value spreads across a diversified set of value measures being much less attractive and outside the historical reasonable range – signs that, as of now, really don’t exist."